Are you missing out on your rates rebate? It seems that Otaki ratepayers may be missing out on rate rebates said Trevor Daniell Local Body spokesperson for Kapiti Coast Grey Power. 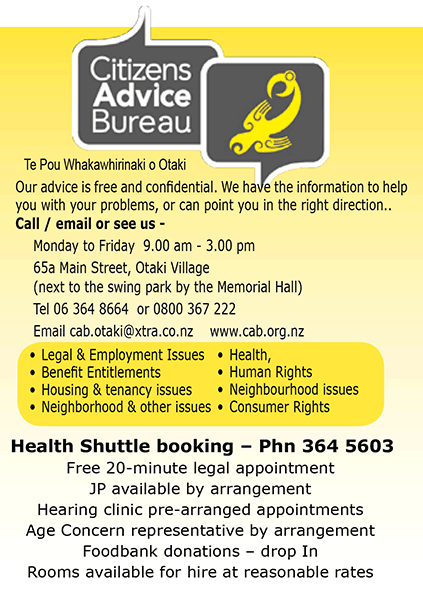 The 2013 census shows that 987 Otaki ward households earn less than $30,000 a year but only 420 claimed the rates rebate and 194 have applied for rates remission due to hardship which is additional to the rates rebate scheme, The rates rebate scheme will result in a rebate of up to $605 and the hardship provision remission rebate of up to $300. There a provision for water charges, costs relating to the repair of leaks. It seems that many are unaware or are not claiming. Those who are not sure if they qualify for both should visit the service centre at the library, or seek advice from the CAB concluded Mr Daniell.